I got it in email titled “The Happy Go Lucky One!! !” and it sure sounds convincing. Photo – Somaliland zoidac sign coins – a set of twelve copper-nickel 10 Shilling coins featuring the twelve sun signs of the western Zodiac. 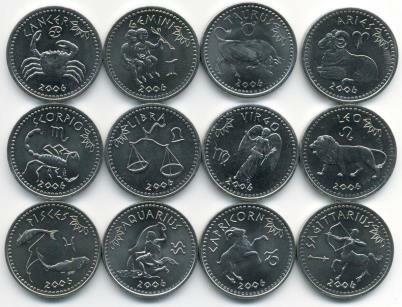 Each coin features a zodiac sign and figure, and is dated 2006. Nice to everyone they meet. Can’t make up their mind. Have own unique appeal. Creative, energetic, and very social. Hates to be alone. Peaceful, generous. Very loving and beautiful. Flirtatious. Give in too easily. Procrastinators. Very gullible. Very organized. Need order in their lives – like being in control. Like boundaries. Tend to take over everything. Bossy. Like to help others. Social and outgoing. Extroverted. Generous, warm-hearted. Sensitive. Creative energy. Full of themselves. Loving. Doing the right thing is important to Leo s. Attractive. Generous, kind, and thoughtful. Very creative and imaginative. May become secretive and vague. Sensitive. Don’t like details Dreamy and unrealistic. Sympathetic and loving. Kind. Unselfish. Good kisser. Beautiful. Good-natured optimist. Doesn’t want to grow up (Peter Pan Syndrome). Indulges self. Boastful. Likes luxuries and gambling. Social and outgoing. Doesn’t like responsibilities. Often fantasizes. Impatient. Fun to be around. Having lots of friends. Flirtatious. Doesn’t like rules. Sometimes hypocritical. Dislikes being confined – tight spaces or even tight clothes. Doesn’t like being doubted. Beautiful inside and out. There are “bad-lucks” ranging from 4 to 20 years and bonus of 1 minutes of luck to 1 years of luck as a reward of sending them to friends too. I don’t know when these people will stop telling such absurd things. If material is good you don’t need to scare or reward people to circulate it. I would certainly forward it (minus those absurd) to my friends! This entry was posted in fun stuffs, Love n Life. Bookmark the permalink. its true!! hehe…can u send my horoscope to me everyday? OMG ITS TRUE EXCEPT MY BFF’S ONE.. CAN U SEND MY HOROSCOPE EVERYDAY? ?